In this article, we have collected 9 new best Responsive websites themes of 21st October 2014. This themes are well-designed and have lots of great features. Amazing theme for creative entrepreneurs, all you need for set up a successful online magazine and even more in the one theme, Dizzy Ezine comes with plenty of advertising placements and responsive AdSense, furthermore it is featured sortable portfolio and support WooCommerce. Foody is a professional multipurpose one Page restaurant template, it’s fully responsive design ready to look stunning on any device. Customize your template easily as much as you want, you have tons of layout possibilities with variations and colors. The template comes with lot HTML pages built using Bootstrap 3.2. PINKMALION is a clean and versatile WordPress theme. The layout suit the needs of a blog or a magazine website, but also have page templates what can be customized for corporate or business websites. The template use a dark color scheme what make it great for any color contrast, according to your visual identity. Healthy is an awesome Health and Medical HTML5 & CSS3 Template is a creative Health and Medical Template with Clean design, it suits perfect for your health, medical, doctors or corporate website. The HTML files are fully customizable. All elements in groups and can easily identify by the group name as well. Atlant is a powerful admin template based on Bootstrap 3.2. Template is fully responsive and retina ready which means it is compatible with mobile devices such as iPhone and iPad. In downloaded package you will find .less files, documentation, clean and commented source code. Atlant is easy to use and customize, also you will find lots of ready to use elements. Larx is a amazing Bootstrap template for Creative, Architecture, Organization, Community, Company Profile, Personal Portfolio, Interior Design, and more. Fully Responsive and Multipurpose template based on Bootstrap 3.2. framework. Responsive Design sections have already been tested on a specific set of browsers and devices, which reduces the work required to launch a website. Miveus is an AngularJS base webapp build with a solid workflow (grunt + bower). Contain many useable HTML elements that can easily integrated with your web application. Miveus New Bootstrap + Angular Admin Template Features Build with AngularJs + RequireJs Load module/controller on demand Solid Workflow (Grunt + Bower) HTML5 and CSS3 Mobile first approach Bootstrap 3.2.0. 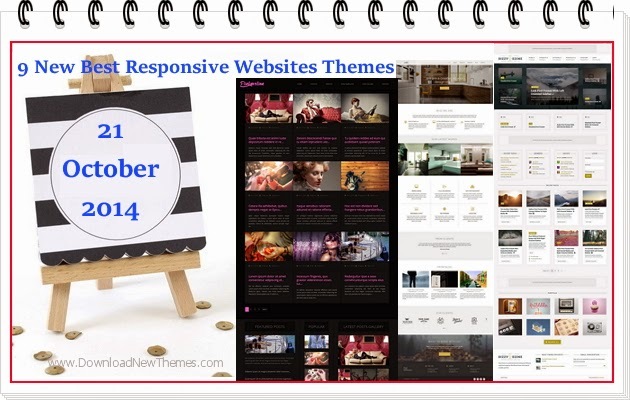 Item Reviewed: 9 New Best Responsive Websites Themes (21st Oct 2014) 9 out of 10 based on 10 ratings. 9 user reviews.